It’s that short but magical time of year when restaurants throw open their doors, tables proliferate along sidewalks and diners take advantage of the balmy evenings. Quick, now, before the muggy midsummer conditions set in for real: This is prime alfresco season and it’s time to book yourself in at Juban Ukyo. For seven years now, this has been one of the best reasons for making a dedicated trip to Azabu-Juban, and not just when the weather warms up and Ukyo’s compact, stylish terrace comes into play. Year-round, the sophisticated crossover fare here fits this traditional neighborhood with its veneer of foreign influences to a T.
Sashimi, tempura, seafood and wagyu beef: the menu covers most of the upmarket favorites. All are intended for sharing and pairing with wine or sake (Ukyo has a great drinks list). 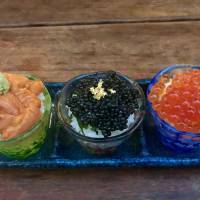 All are put together with admirable attention and taste — and almost invariably are dressed up with an extra layer of culinary bling that leaves most other izakaya taverns in the shade. The potato salad is a perfect example. The coarsely mashed, yellow-hued spud is mixed with plenty of egg yolk and chewy chunks of flavorful ham, and then served covered with a generous coating of shaved truffle. Ditto the shūmai: These steamed dumplings are stuffed with minced pork and chicken, into which uni (sea urchin) is blended. And they’re presented — just two of them per serving — topped with a whole orange tongue of the same rich seafood. This pattern is repeated through the meal. One of Ukyo’s signature dishes is the kani kuriimu korokke. Elsewhere, these creamy croquettes contain only the slightest hint of crab, but here they are formed around actual crab legs, with plenty of fresh crabmeat inside the perfectly crisp-brown, deep-fried breadcrumb casing. Extra points are in order for the homemade tartar sauce on the side. Here’s a curiosity: a savory “creme brulee” made from creamy ika shirako (squid milt), which is blowtorched to give it a thin crust and then served chilled, topped with a gelee of ponzu (soy sauce, rice vinegar and citrus) and a small scoop of lumpfish caviar. It’s not a big serving, nor (like anything at Ukyo) is it cheap. But it’s surprisingly satisfying. Everything is eminently Instagrammable, and none more so than the ochoko-don. 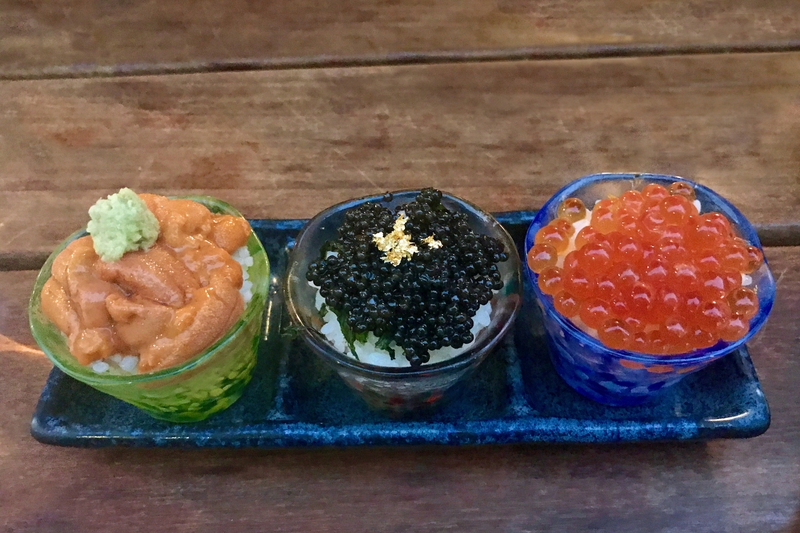 These mini donburi rice bowls come with a choice of three different deluxe toppings: a thick layer of uni, with a dab of wasabi; a generous covering of caviar, garnished with gold leaf; or glistening orange-red pearls of ikura (salmon roe). As the menu actually points out, order the set of all three and watch the “likes” pour in. Don’t expect just to roll up and be seated. Juban Ukyo is very popular and its inside counter needs to be booked well ahead of time. But reservations for the terrace tables are taken on the same day; just get on the phone at 4:30 p.m. prompt (5 p.m. on weekdays) to secure your place. You can even bring young children and/or the family dog. It’s that sort of place — and that sort of neighborhood. 6 p.m.-4 a.m.; Sat. and holidays from 5 p.m.; Sun. 5-11:30 p.m.